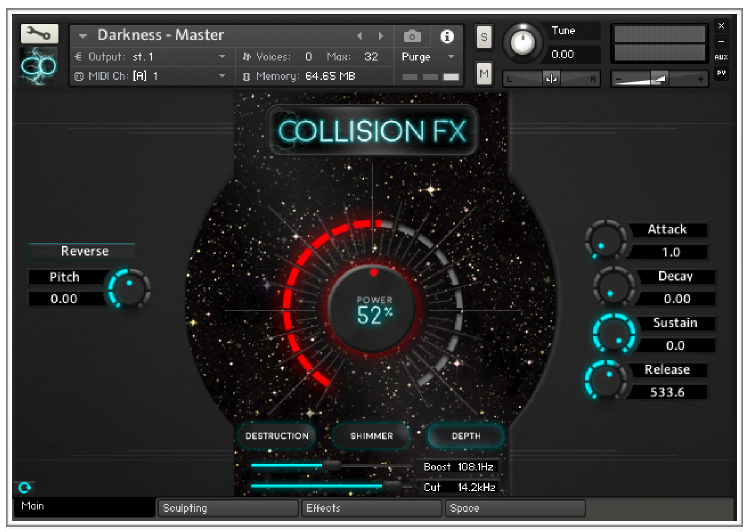 Collision FX is a Kontakt-based sound design tool built in part from three SFX Libraries created by Epic Stock Media: BlockBuster Trailer, Bane Cinematics and Asylum. Epic was co-founded by developer Andrew Scudder, who also co-founded Sound Yeti along with Collin and John Scudder. 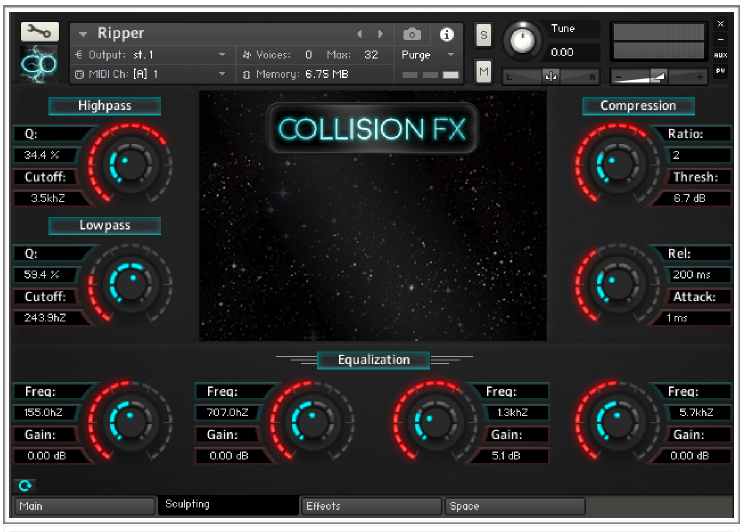 Content from the Epic libraries has been compiled, sequenced and processed to create six instrument categories: Collision FX Themes, Environments, Movement, Stingers, Tempo Sync Sequences, and Textures. The Main Page has a sort of deep space aesthetic with various animations such as concentric glowing circles that emanate from the center outwards when the Depth tab is active. 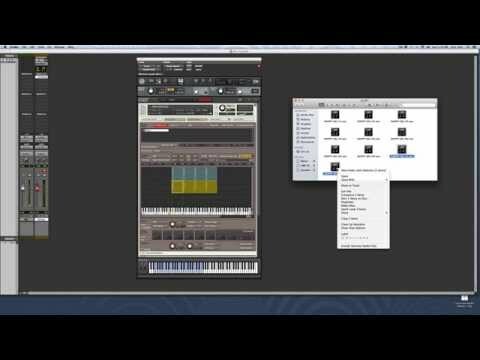 This page gives quick access to distortion/saturation effects (Destruction Tab), resonant HP Filter (Shimmer Tab) and compression/EQ (Depth Tab). Clicking on a Tab changes the visible parameter controls and the center knob is the FX intensity. Also available on the Main page is an ADSR section and controls for sample playback direction and pitch. 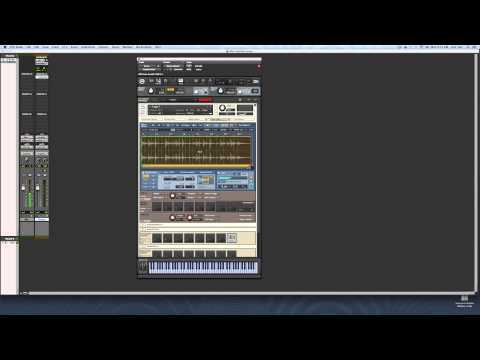 The Sculpting Page combines controls for HP and LP Filters, Equalization, and Compression. The Effects Page is really where the magic happens with this instrument. It’s laid out in two main sections. 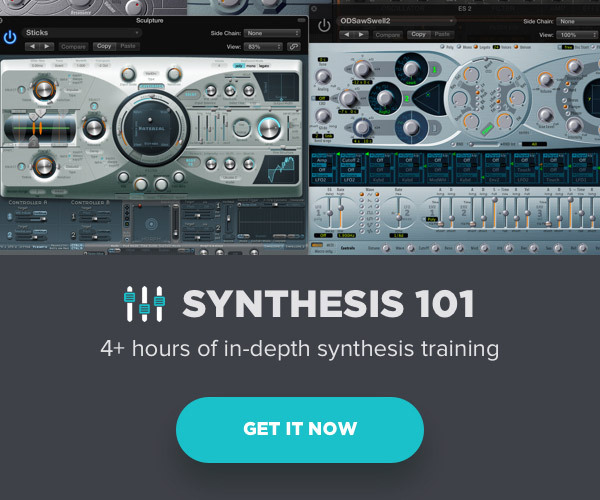 The top offers access to the parameters of several available effects such as tape saturation, delay, chorus, time screamer, etc. Turning on an effect reveals access to its parameters and the ability to select one of three modulation sources for each: Envelope, LFO or Step Sequencer. The controls for each modulation source are displayed in the bottom half of the page, complete with mesmerizing visualizations. 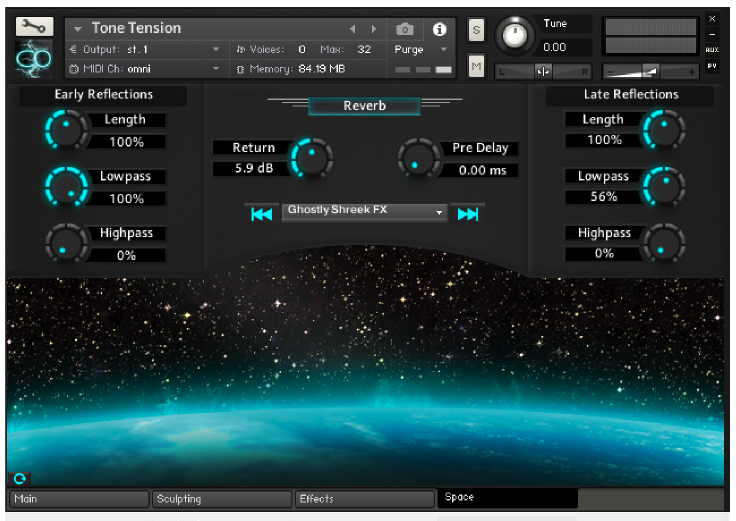 The Space Page, as the name implies, offers controls for a convolution reverb that includes 190 custom IRs. My criticisms of Collision FX are relatively minor. Some tabs could have been named more appropriately, specifically the Shimmer and Depth Tabs are somewhat deceptively labeled based on their actual function. 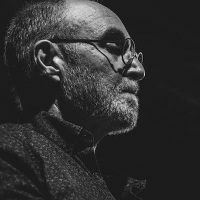 The center control on the Main page causes intermittent clicks and pops when adjusted as a sound is playing, which limits its playability in real time due to these unwanted artifacts. It would have been nice to have pre-configured Key triggers for FX settings, especially since the instrument does have a fairly robust processing section. The price published on the Sound Yeti website as of this writing was an amazing $129 (which also includes an additional package called Epic Movie Trailer). There are some rich and powerful sounds possible with this instrument and it seems particularly suited for scoring trailers and action sequences. It is well worth the current price in my opinion.